This specially priced BASIC TRAD RACK has been carefully selected to offer you a variety of modern nuts, 'biners & passive protection that will serve as your initial, core set of hardware. 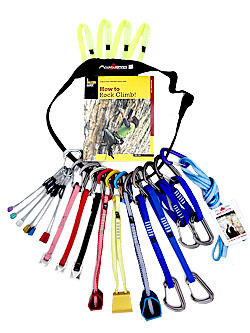 Any top rope problem as well as many moderate routes can be adequately protected with this versatile rack that ranges from 1/4" - 3". Be racked and ready to lead with a modest investment and then add to this excellent starter kit as your experience grows.